All articles mentioned in this blog post are free to access until 20th September. This time of year, many of us involved in teaching are looking at how to refresh our reading lists for the upcoming academic year. Here at Policy & Politics, we thought that we would give a little helping hand with that by going through some of our latest content that we think will help students understand the things we try to teach. For those of us teaching concepts, models and theories of the policy process, the recent Weible and Cairney special issue on ‘Practical lessons from policy theories’ is a gold mine where many of the papers give a good account of their respective field, whilst seeking to take the concepts forward and increase their policy relevance. This includes articles on the Multiple Streams Approach, Institutional Analysis and Development, Punctuated Equilibrium Theory and the Advocacy Coalition Framework that will all help students make sense of these concepts. Internationalising the curriculum is of increasing importance. With international students making up such a big part of the student body, we need to make the teaching material more relevant to their realities at home. We have two recent pieces on privatisation and marketisation in China that can help here. The effects of privatisation on the equity of public services investigates whether efforts to reverse privatisation have improved citizens’ access to public services. Meanwhile, Commercial investment in public–private partnerships looks at the drivers of private investment and comes up with a series of recommendations for local governments seeking to increase public-private partnerships. A number of recent articles have addressed questions of direct democracy, participation and deliberation with examples from multiple countries. Elite capture of local participatory governance looks at obstacles to citizen engagement in development projects in Bangladesh. Public deliberation in an era of communicative plenty argues that as long as there are spaces for listening and reflection, there is scope for large-scale public deliberation to work despite an overload of information and opinion. Another paper addressing deliberative direct democracy is When the people speak, which analyses how ordinary citizens fare when arguing against policymakers in these contexts in Switzerland. As people in the UK deal with the consequences of the Brexit referendum, Vatter et al. offer a timely literature review and suggestions for further research on direct democracy. They suggest that more attention be paid to the relationship between direct democracy and policy implementation (maybe one for David Cameron), as well as putting forward a new theory for understanding voting behaviour in direct democratic votes. On another scale, Citizen participation and changing governance looks at devolution in England and argues that it has largely failed to include meaningful public engagement. The authors go on to show that deeper public engagement is both possible and productive. Lastly, if you (like me) teach on neoliberalism and austerity Policy & Politics have a number of relevant recent articles. Christopher Byrne offers an up-to-date review of the literature on neoliberalism as a concept before arguing that a governmentality approach avoids many of the common pitfalls in the usage of the term. Austerity in the making argues that the increasingly common social impact bonds are ‘part of a neoliberal political project that uses austerity as an economic and moral symbol to manufacture consent for social service reform’. Contributing to the literature on austerity urbanism, Local governance under austerity is based on research in Cardiff and examines how what the authors call ‘hybrid officers’ at the frontline experience austerity and what the implications of this is for governance at different levels and scales. Moving to Southern Europe, Adam Standring explores efforts to depoliticise austerity reforms in Portugal from 2011 to 2015. He argues that the Portuguese case is an example of how depoliticization ‘relocates politics and the political rather than annihilating it’. These are only some of the themes that recent Policy & Politics output speak to. The recommended articles here would all make great contributions to syllabi in various social science fields under the suggested or related topics. There is a full bibliography below, allowing you to copy and paste easily into your syllabus. I hope you all enjoy reading in the sunshine! Byrne, C. (2017) ‘Neoliberalism as an object of political analysis: an ideology, a mode of regulation or a governmentality?’, Policy & Politics, 45(3): 343–360. Cairney, P. (2018) ‘Three habits of successful policy entrepreneurs’, Policy & Politics, 46(2): 199–215. Ercan, S.A., Hendriks, C.M., Dryzek, J.S., (2018) ‘Public deliberation in an era of communicative plenty’, Policy & Politics, DOI: 10.1332/030557318X15200933925405. Gerber, M., Mueller, S. (2017) ‘When the people speak – and decide: deliberation and direct democracy in the citizen assembly of Glarus, Switzerland’, Policy & Politics, 46(3): 371-390. Heikkila, T., Andersson, K. (2018) ‘Policy design and the added-value of the Institutional Analysis Development Framework’, Policy & Politics, 46(2): 309–24. Joy, M., Shields, J. (2018) ‘Austerity in the making: reconfiguring social policy through social impact bonds’, Policy & Politics, DOI: 10.1332/030557318X15200933925397. Koski, C., Workman, S. (2018) ‘Drawing practical lessons from punctuated equilibrium theory’, Policy & Politics, 46(2): 293–308. Pill, M., Guarneros-Meza, V. (2017) ‘Local governance under austerity: hybrid organisations and hybrid officers’, Policy & Politics, 46(3): 409-425. 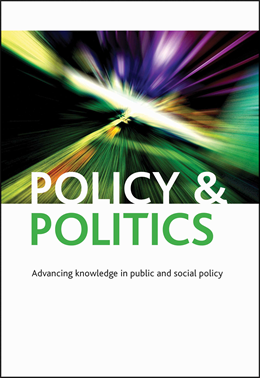 Prosser, B., Renwick, A., Giovannini, A., Sandford, M., Flinders, M., Jennings, W., Smith, G., Spada, P., Stoker, G., Ghose, K. (2017) ‘Citizen participation and changing governance: cases of devolution in England’, Policy & Politics, 45(2): 251–69. Standring, A. (2018) ‘Depoliticising austerity: narratives of the Portuguese debt crisis 2011–15′, Policy & Politics, 46(1): 149-164. Vatter, A., Rousselot, B., Milic, T. (2018) ‘The input and output effects of direct democracy: a new research agenda’, Policy & Politics, DOI: 10.1332/030557318X15200933925423. Waheduzzaman, W., As-Saber, S., Binte Hamid, M. (2018) ‘Elite capture of local participatory governance’, Policy & Politics, DOI: 10.1332/030557318X15296526896531. Wang, H., Chen, B., Xiong, W., Wu, G. (2018) ‘Commercial investment in public–private partnerships: the impact of contract characteristics’, Policy & Politics, DOI: 10.1332/030557318X15200933925414. Wang, H., Mu, R., Liu, S. (2017) ‘The effects of privatisation on the equity of public services: evidence from China’, Policy & Politics, 46(3): 427-443. Weible, C.M. and Cairney, P. (2018) ‘Practical lessons from policy theories’, Policy & Politics, 46(2): 183-197. Weible, C.M., Ingold K. (2018) ‘Why advocacy coalitions matter and practical insights about them’, Policy & Politics, 46(2): 325–43.